It is nearly springtime in Japan. Which means many popular coffee and sweet shops all over Japan release adorable and delicious sakura (cherry blossom) drinks and sweets. One of the most awaited items every year are the Starbucks sakura drinks and goods. 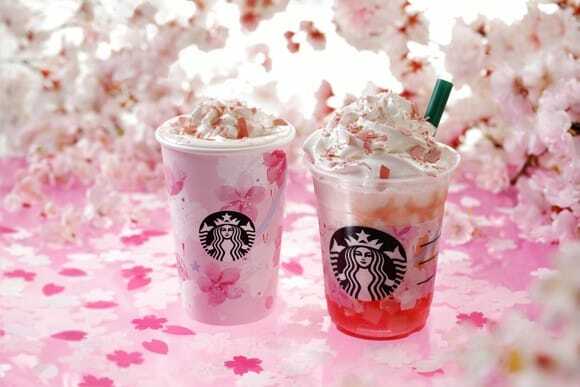 For 2019 Starbucks pair two popular pink flavors, cherry blossom and strawberries. The "SAKURAFUL Milk Latte" has a light sakura flavor and is described as tasting like spring. It is topped with whipped cream and strawberry chocolate shavings and chocolate sakura flavored petals. This drink is meant to capture the moment when a gentle wind blows through the cherry blossoms and they are slowly falling down. The sakura flavored base of the "SAKURAFUL Frappuccino" is placed on top of red and pink strawberry jelly. This creates a combination of creamy and springy textures when you drink it through the straw. The Frappuccino is also topped with whipped cream, strawberry chocolate shavings, and sakura flavored chocolate petals. It represents the cherry blossoms floating in a river. On February 12th, 2019 Starbucks will also release "Sakura Chocolate WITH Strawberry Jelly" at most convenience stores in Japan. The drink will have a Sakura and white chocolate flavored base mixed with firm strawberry jelly. It creates a similar texture to the SAKURAFUL Frappuccino. Shake well before you drink it! Sakura printed goods are the most awaited part in Starbucks spring line-up. The first line is held in soft pink colors and will be released on February 15th, 2019 alongside the sakura beverages. This year the goods even include a pouch (2000 yen) and notebooks (1900 yen each). Please note that there are some items that are not available in every store. Number seven and eleven are only available in the Starbucks online store. Seventeen, twenty and twenty-one will only be available at the Starbucks store in Nakameguro. The second series of goods will be available from February 25th, 2019 and the colors will be much more vivid in reference to the strawberry theme. It even includes a blanket and bottle warmer set (2300 yen). The glass (nine) will be only available at the Nakameguro Starbucks. If you like number fifteen or twelve, you will only be able to purchase them at the Starbucks online store.